Paths and stiles is an easy quilt block pattern. The design has been known by other names over the years, including 'Friendship,' because one of its panels is sometimes used to hold a signature when friends get together to hold a block exchange or sew a gift quilt. Light fabrics and dark fabrics were often reversed in this design. Some quilt blocks known as Paths and Stiles have a nine-patch center. Finished Paths and Stiles quilt block: 9" x 9"
The cutting instructions are for two identical quilt blocks. Repeat to make additional blocks from a scrappy assortment of fabric. Choose a white or white on white fabric for the background. Choose a small to medium scale floral for other areas. Try to avoid floral fabrics with lots of white because those areas will probably blend into the white background fabric, reducing the definition of patchwork boundaries. Vary the fabrics as much as you wish. Maybe you'd prefer a dark background. Or maybe you'd like a center that doesn't match the other fabrics. Paths and stiles is perfect for any theme or type of fabric. Two strips 1-1/2" x 15"
Four strips 1-1/2" x 15"
This pattern was written for a quilting block exchange, where quilters typically sew with small pieces of fabric from their stash of leftovers. Make additional, identical quilt blocks by increasing the numbers of squares and either lengthening the 1-1/2" wide strips or cutting additional shorter strips to yield more segments. Gather your 3-7/8" floral and white squares and sew each light and dark square together as shown in the tutorial for half square triangle construction. If you are using slightly larger squares trim each half square triangle unit back to exactly 3-1/2" after assembly. Trim-back instructions are included in the link above. You should have eight half square triangle units (not shown). Sew a 1-1/2" x 15" white strip lengthwise to a floral strip of the same size. Press the seam allowance towards the floral strip. Repeat to sew another white strip to the opposite side of the floral. Press the seam allowance towards the floral. Move the strip set you just assembled to your cutting mat. Square up one end of the strip set so that it is at a 90-degree angle to the long edge, then cut four 3-1/2" segments from it. Repeat, sewing the remaining 1-1/2" x 15" strips together the same way. Cut four more 3-1/2" segments. 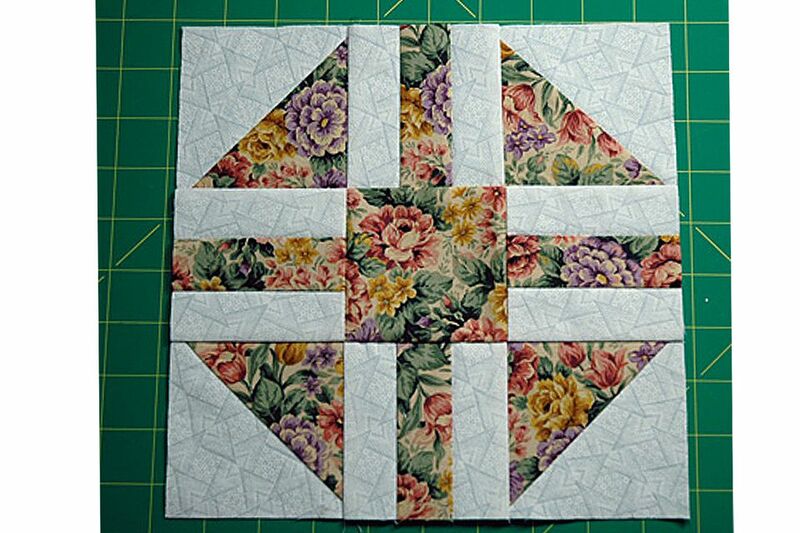 Arrange four half square triangle units and four strip pieced segments around a 3-1/2" center floral square. You'll have three rows and three columns. Make sure the pieces are oriented correctly: narrow floral strips should "point" at the center square and white sections of triangle square units should be in the outer block corners. Sew the components of each row together. Pin patchwork to keep fabrics from shifting. Press seam allowances in rows 1 and 3 away from the center unit. Press seam allowances in the middle row towards the center square. Sew the rows together, matching seam intersections carefully. Placing a fine straight pin at each end and through each matched seam allowance helps ensure that units won't shift. Press the quilt block. Use the remaining units to make a second block.